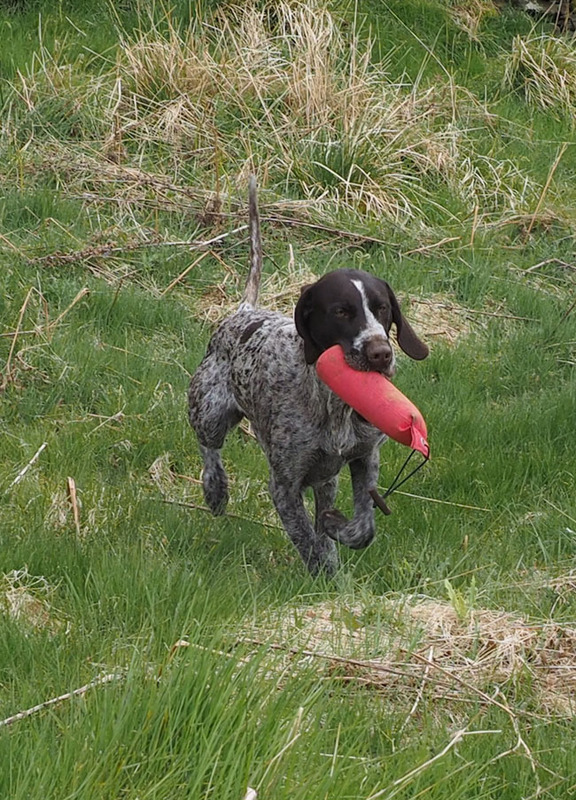 Pointers and Setters only need to hunt and point. 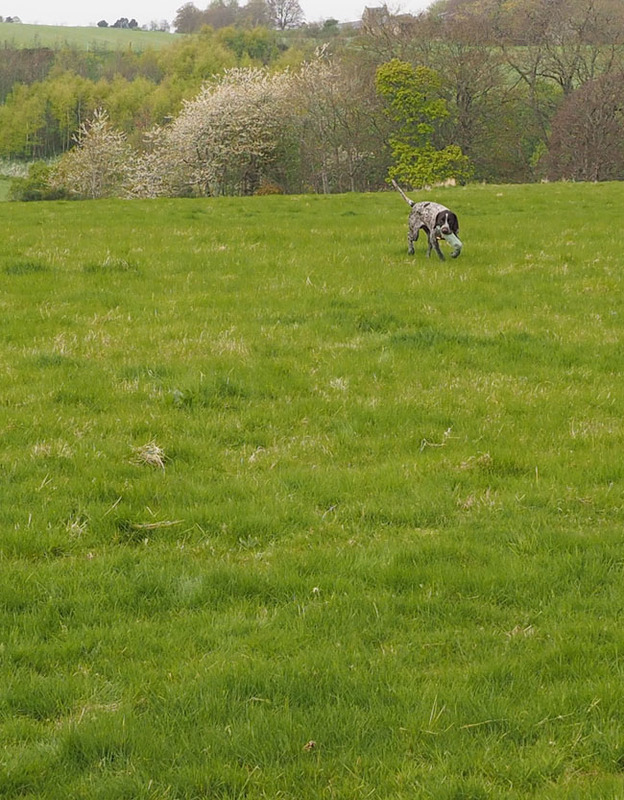 Labradors only need to hunt a bit, but mainly just retrieve. 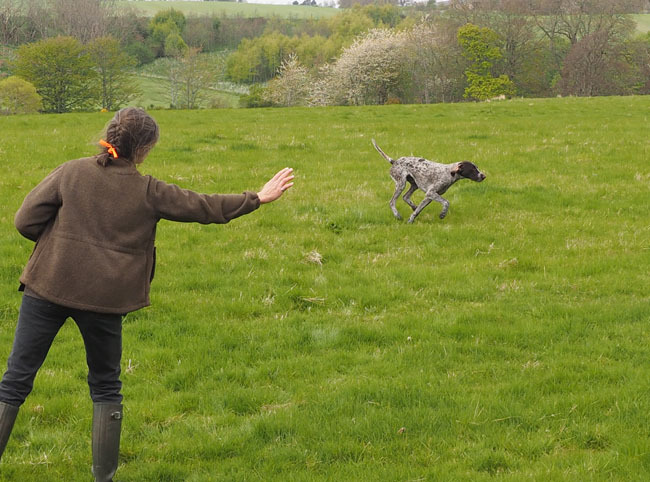 HPRs, such as German (Short-, Wire- or Long Haired) pointers, Vizlas, Munsterlanders, Brittanies etc need to hunt, point AND retrieve. 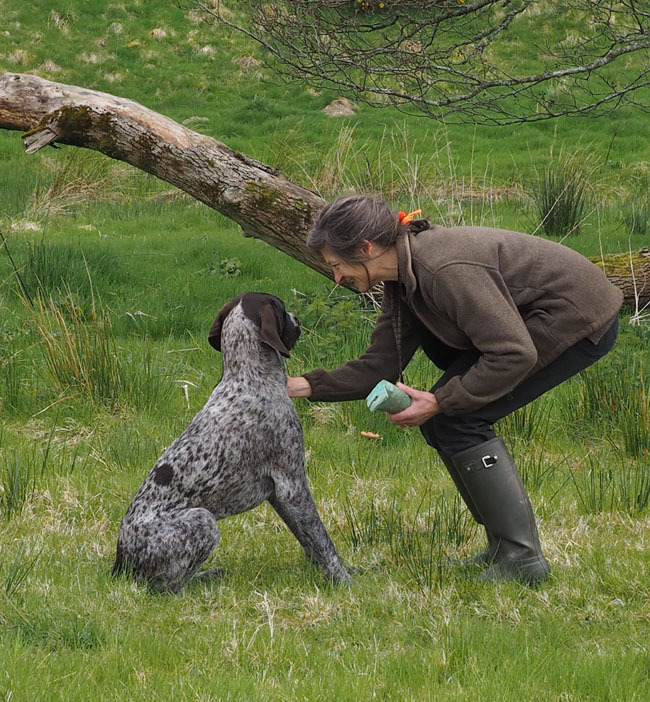 This means that a HPR dog has to know everything a Pointer or Setter knows and everything a Labrador knows. So there is plenty of training to get on with. 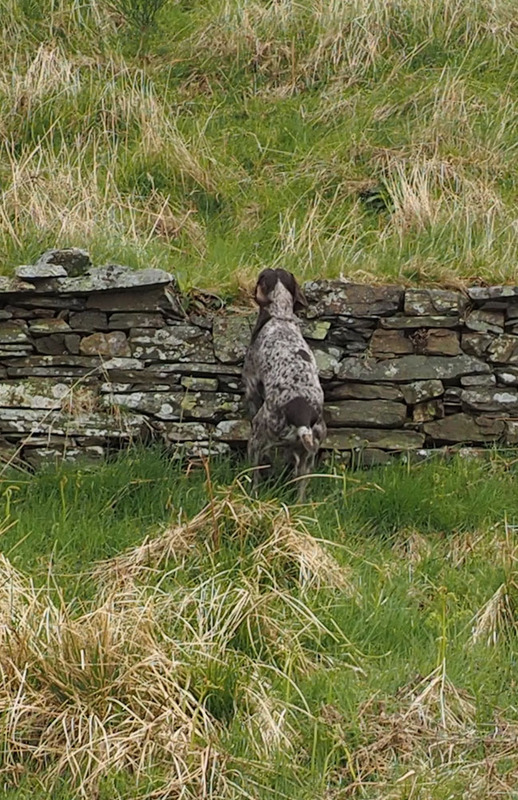 As previously described, Pontus has started to point a bit on snipe and I have also spent a good deal of time with him on grouse. 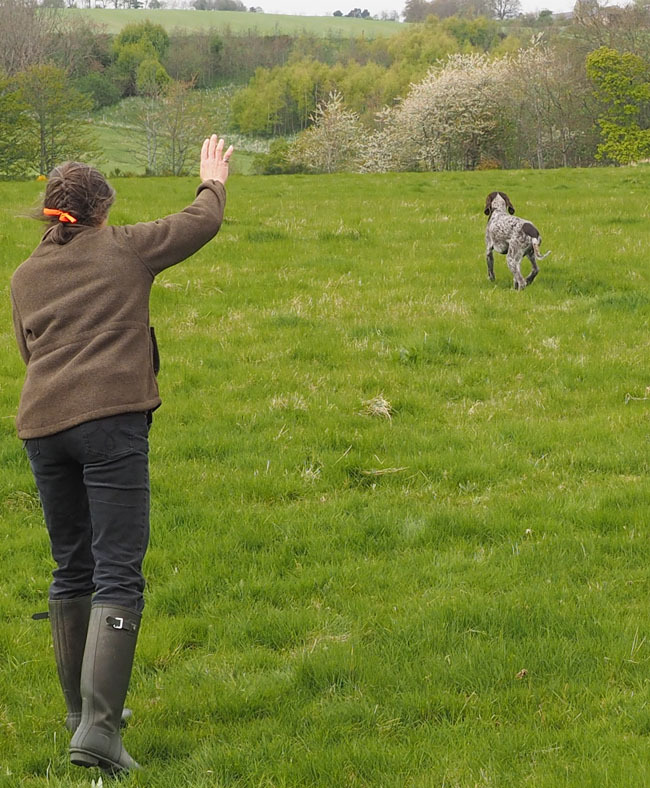 He definitely started to point and his hunting and obedience is getting very good. He has a nice, natural pattern and tends to cover the ground systematically. 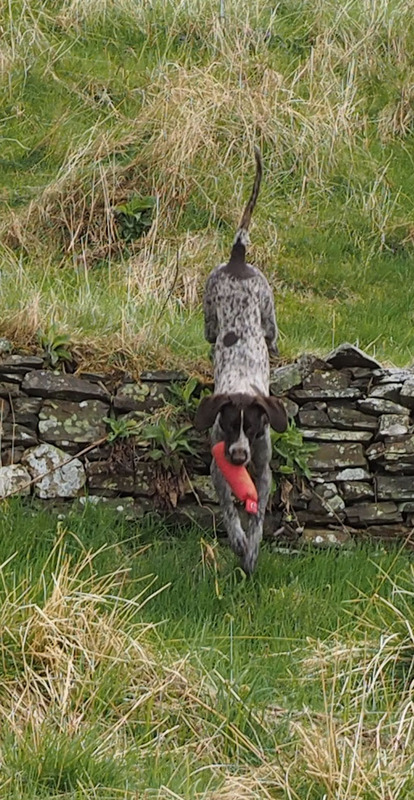 It is now nesting season for the grouse and all other ground nesting birds, so hunting training is suspended for the summer, which means that the (boring) dummy training is the best thing to invest in now. 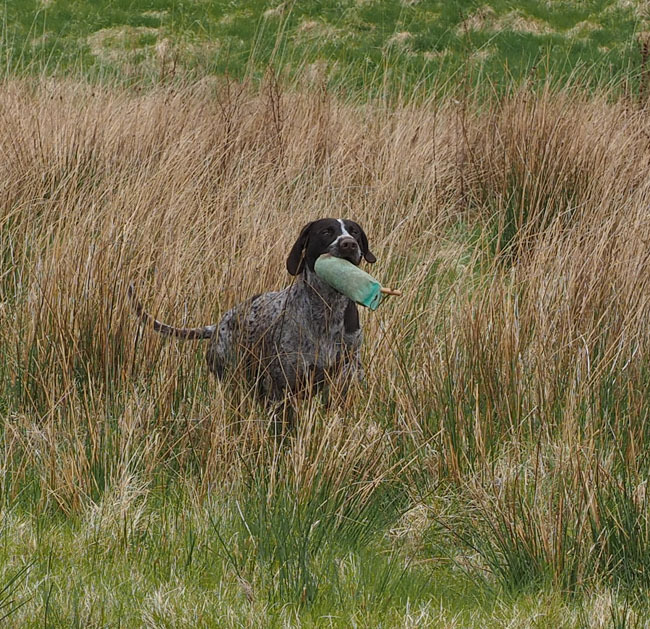 Pontus has, as previously described in my blog, learned the controlled retrieve, which means he politely comes and sits, holding the dummy till I take it. 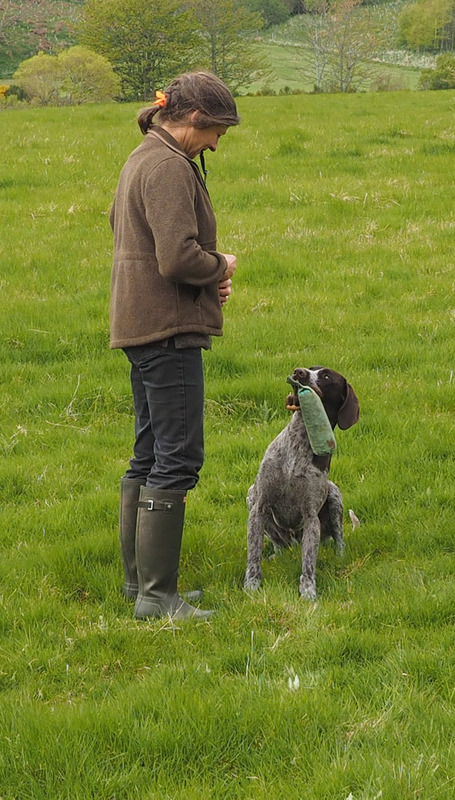 Holding the dummy, slightly awkwardly…. 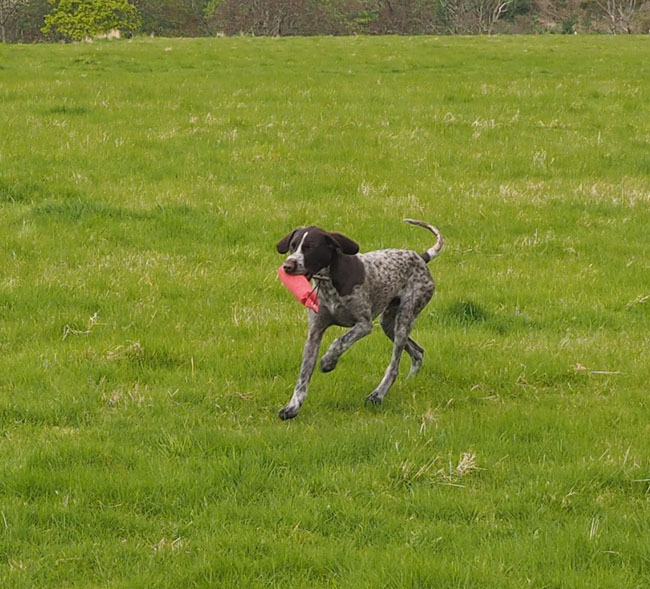 I walk out with a dummy with the dog to heel. 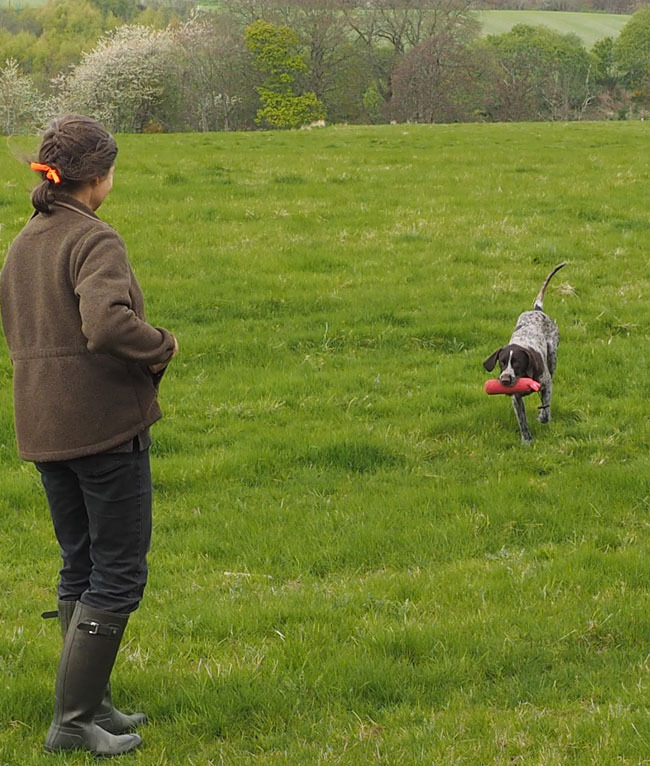 Walking out with the dummy. 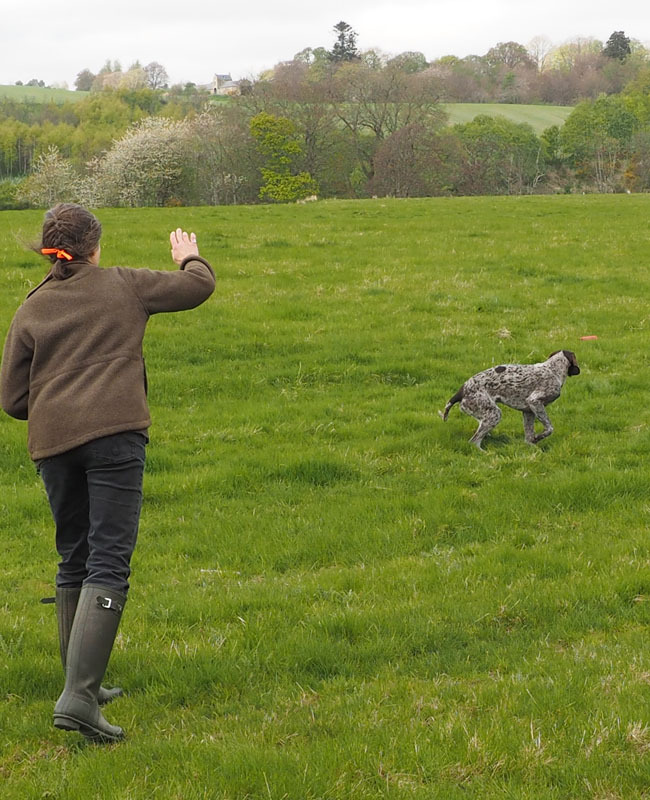 Throwing the dummy for the dog to mark it. 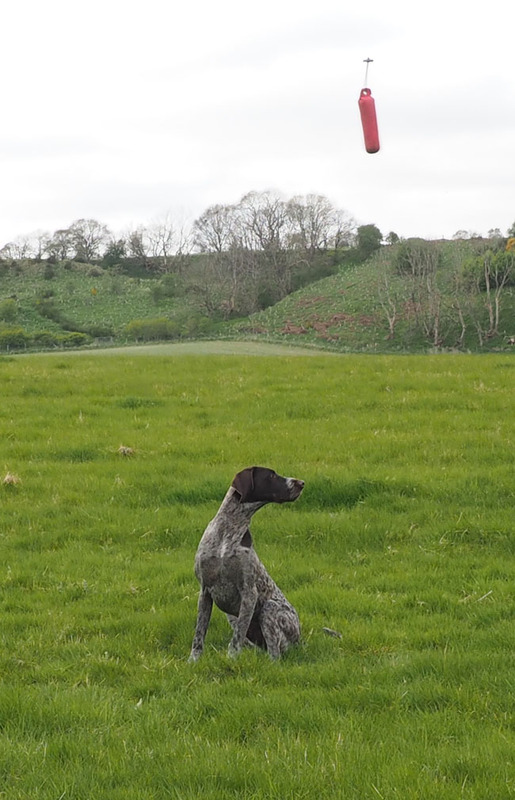 Throwing dummy for the dog to remember it. 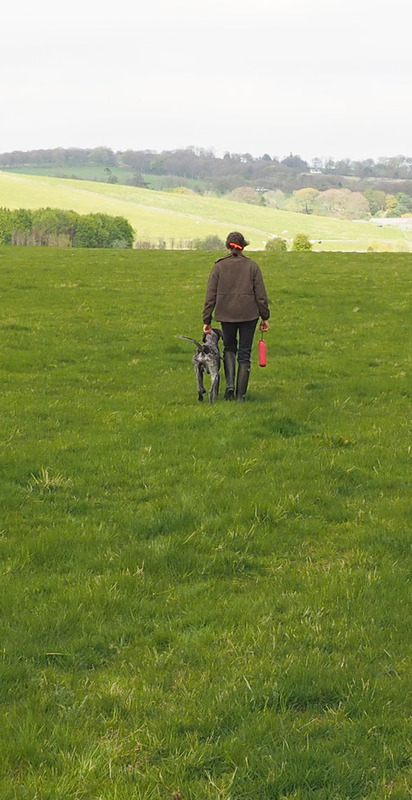 Walking puppy back hoping his memory lasts. 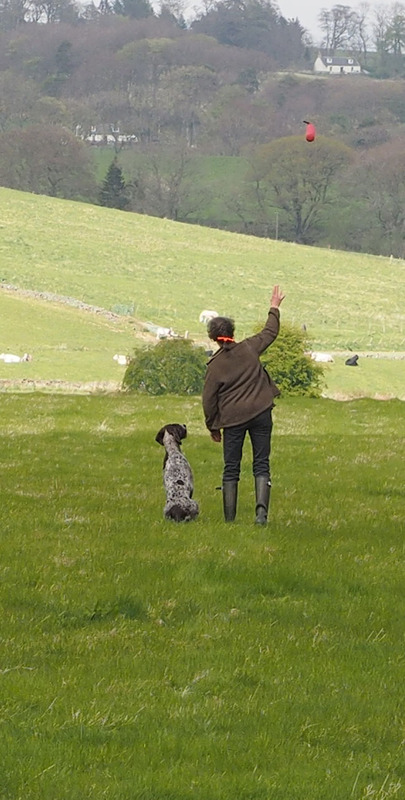 Sending the dog for the retrieve helping it along with hand signal. 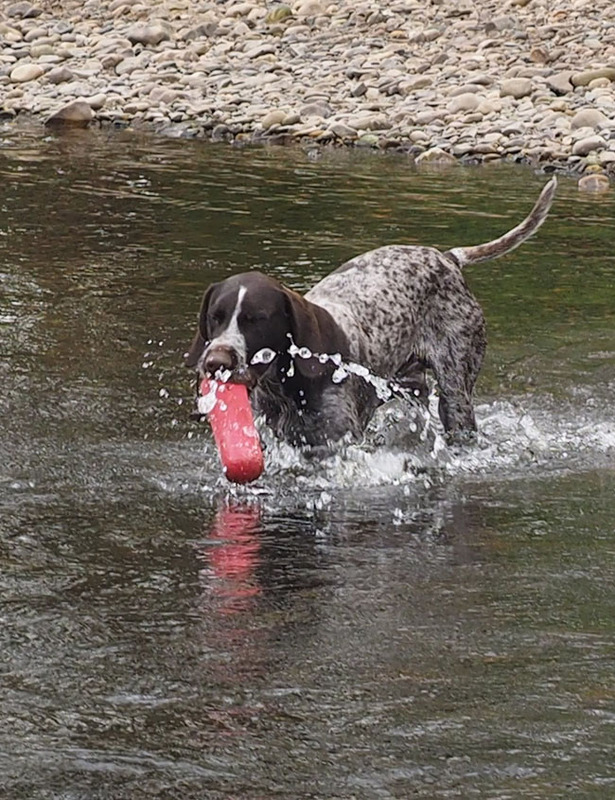 This sets the basis for later blind retrieves later. Being steady to the throw. 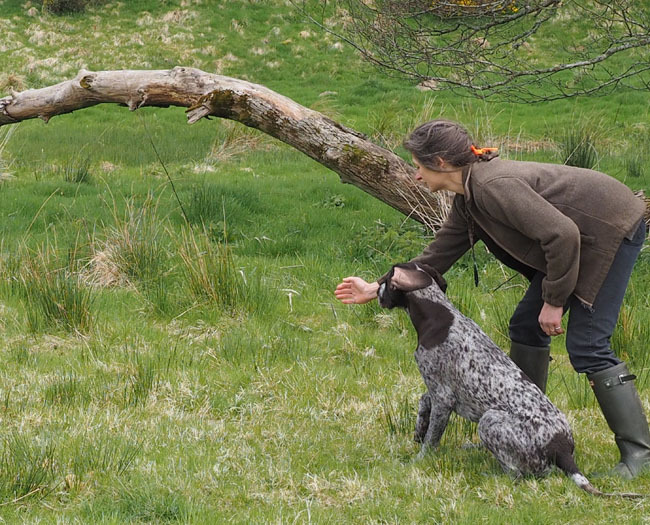 The dog needs to sit down and be steady to dummies being thrown. The most tempting one is when you throw it right over the dog’s head. After the fall, the dog must sit steadily till it is asked to retrieve. Tempting, flying dummy over his head. 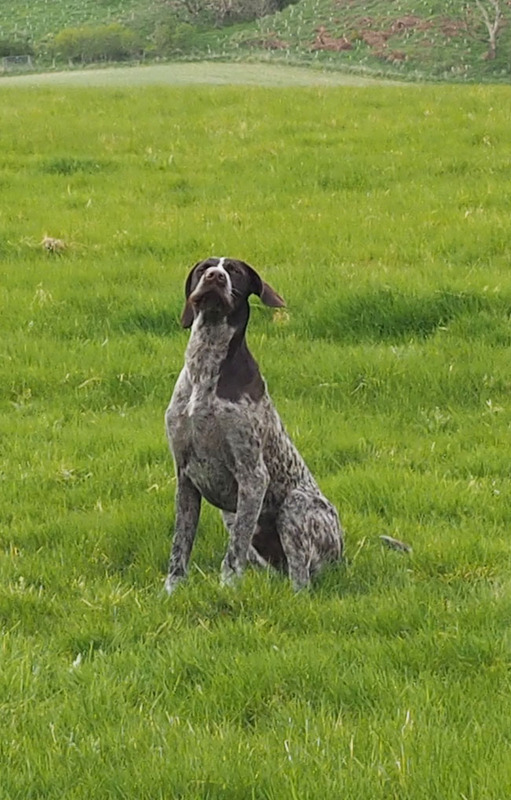 Waiting to be asked to retrieve. 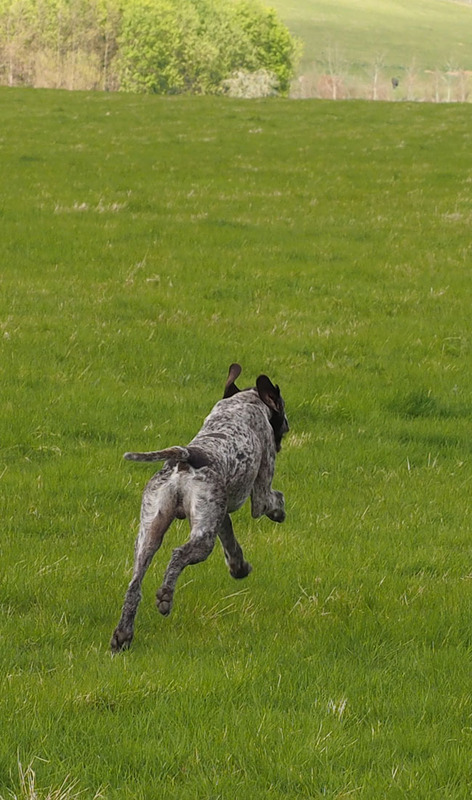 One thing that takes a bit longer is the Right-Left and Back command. 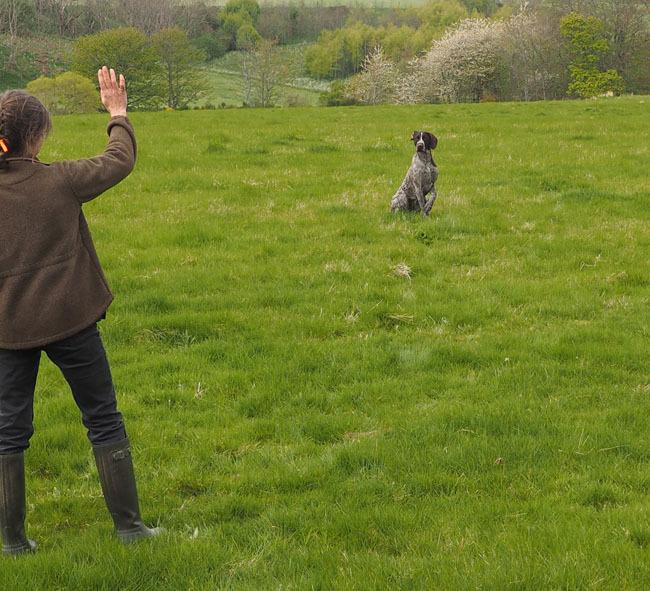 In an open field, place two dummies and train the dog to understand if you want the one to the right, the left or the one behind the dog. First the dog must sit in the middle of the triangle till you give it directions. 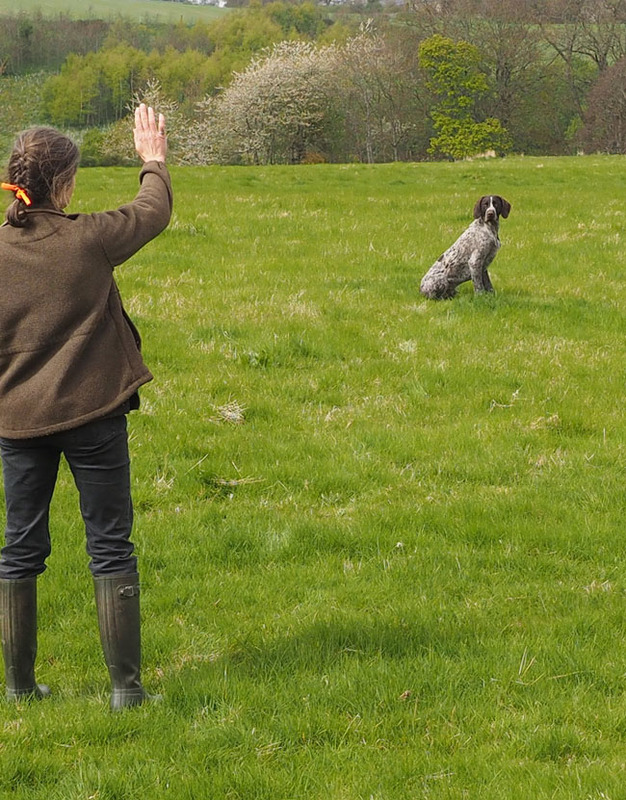 Then you say “Out” and wave to the side, you want the dog to go. 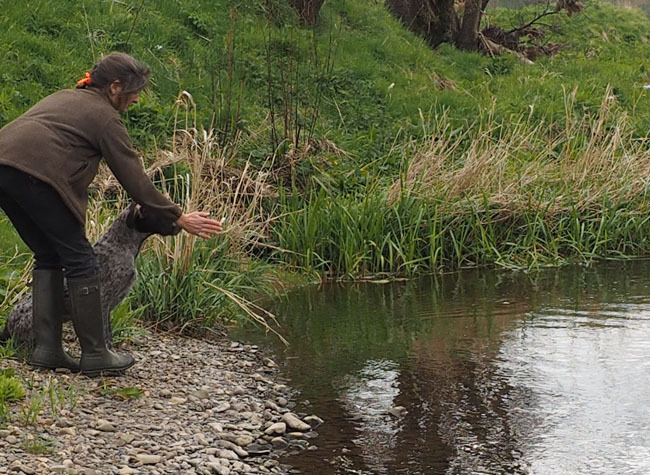 Correct gently if he gets it right and eventually the dog will understand the right and left wave. Very pleased with one self. And then the going back for the one lying behind him with the “Go back” command. 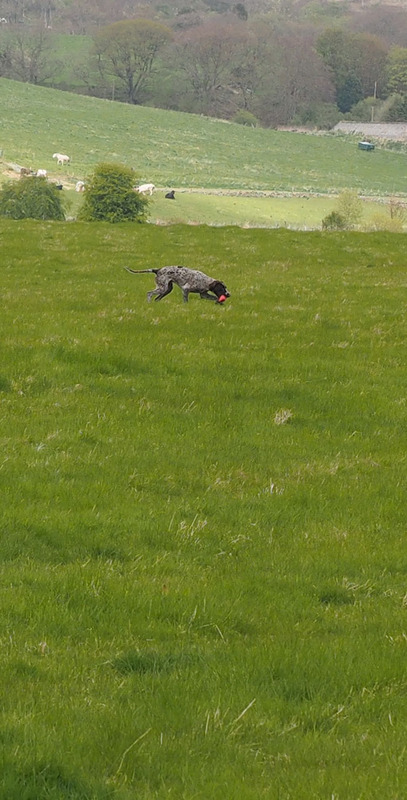 As a very small beginning I cover his eyes while a friend throws a dummy in the long grass. 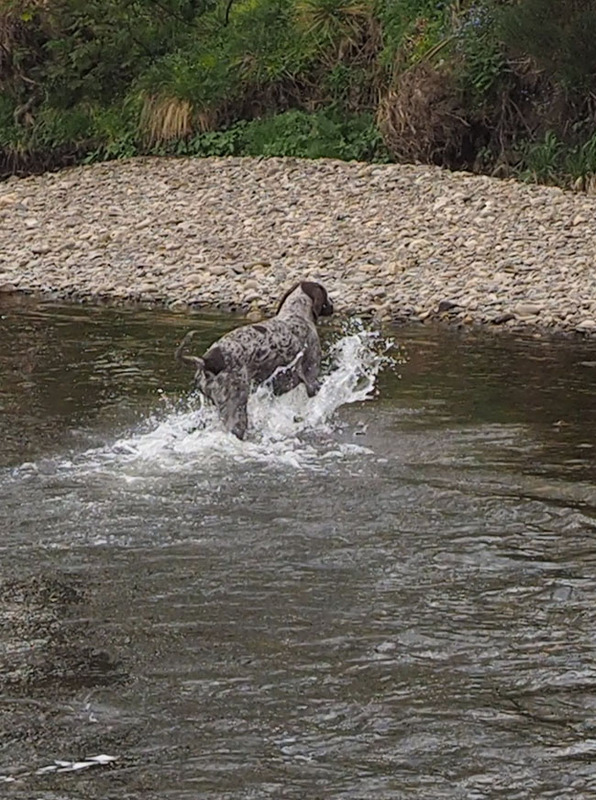 Then I set him up with the hand signal and use the above corrections if I need to help him find the dummy. 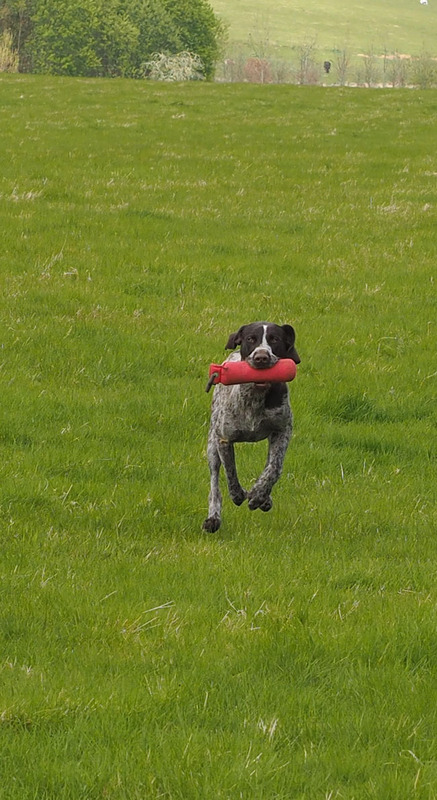 Successful find in the long grass. 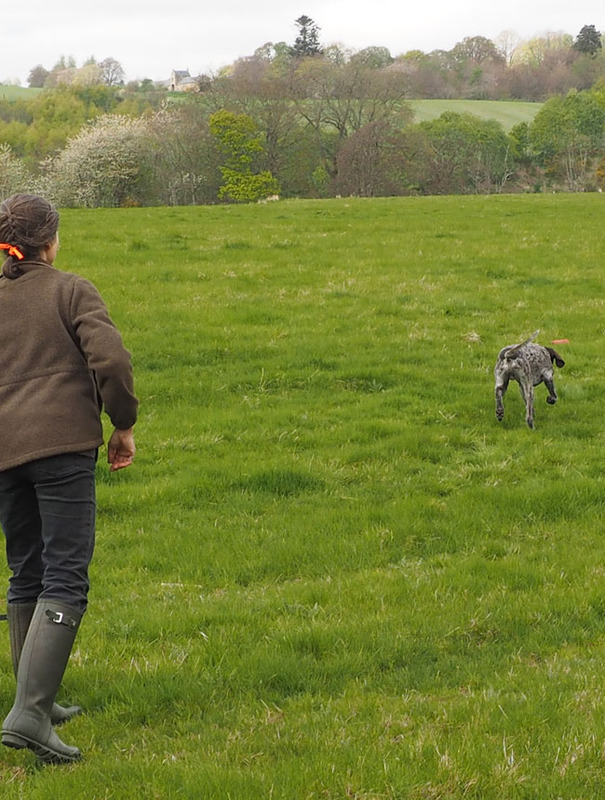 Obstacles are part of a shoot day and it’s best get the dogs used to all sorts. Here, on the ground today there is a wall on the grass slope very suitable for training. 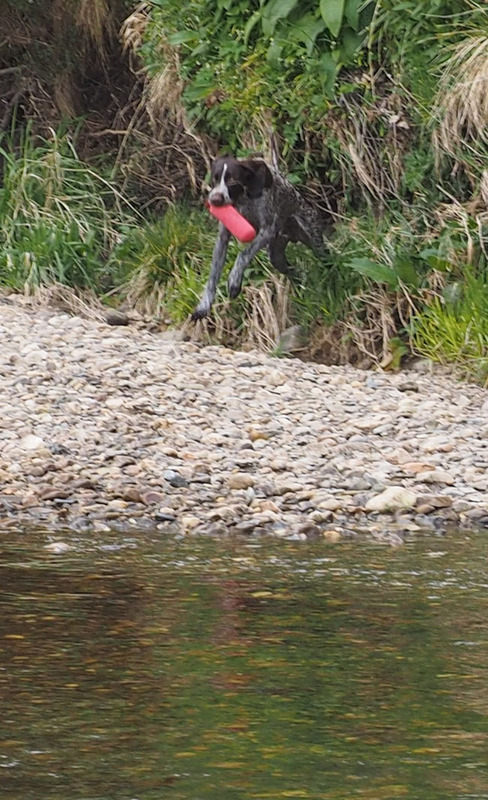 So a dummy is thrown over the wall and Pontus retrieves. A bit of wall does not phaze Pontus. Ready with hand signal although he can see it. Delivery without dropping the dummy. 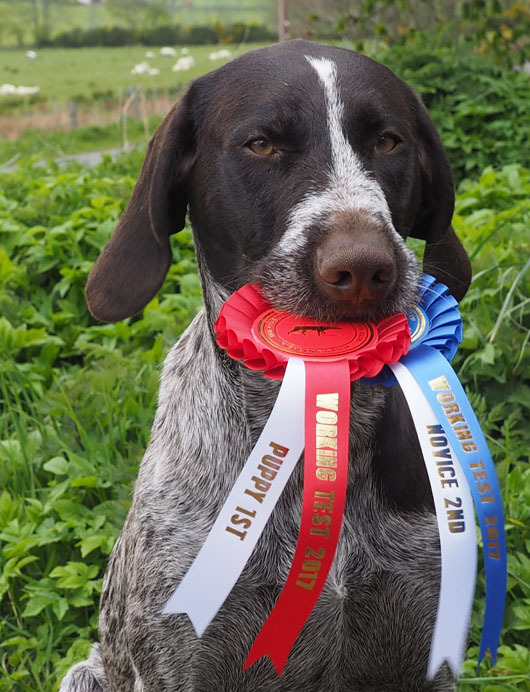 And guess who won Puppy class and got a second in Novice at the weekend? 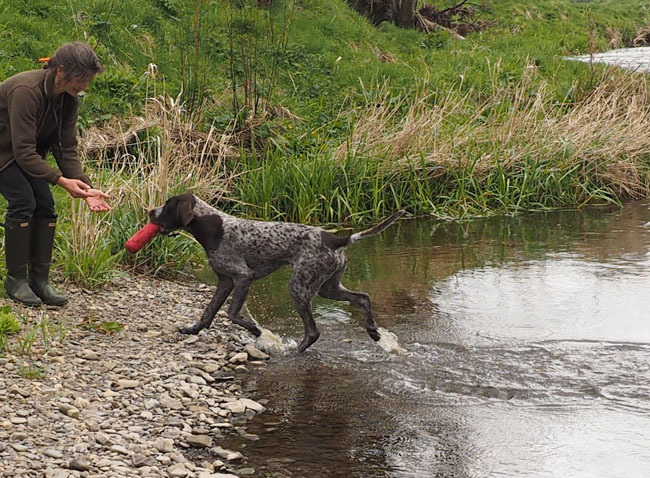 Pontus is now 10 months old and although we do all the boring dummy retrieving, it never becomes quite as much as it ought to be because it is really very boring. Also, I have been taking advantage of the pre-nesting tim..